Trying out new foods, flavours, experiences; these are things that rock my boat. I can be shaken out of deep hibernation, meditation, or procrastination with a promise of something new to see, try, and eat. Not that I was, hibernating, meditating, or procrastinating all this time: rather, I was adjusting to the thought of being a Mommy again. Yes, a little baby girl is on her way in early Fall. Blogging or eating – anything related to food – was far from my thoughts for these last few months. That is, until an opportunity to create fell into my lap – creating recipes, is what I absolutely love to do. Of the five, the maple gastrique was my absolute favourite. It’s deliciousness lays in the tartness of apple cider vinegar which complements the sweetness of maple syrup to such a level that I wanted to drink it in spoonfuls. Trust me on that one. 1. You will be pleased to see I have used the Vanilla Cinnamon & Star Anise is a cocktail drink. The duty of taste tester fell to my husband, since I am barred from drinking for a while (for the most wonderful of reasons). I was told by my deputized husband that the drink strongly resembles a caipirinha with a fruity twist. 2. I used the Maple Gastrique: Maple Syrup, Ginger & Apple Cider Vinegar to create a hearty drizzle for BBQs and meats. The gastrique is so full of potential. 3. 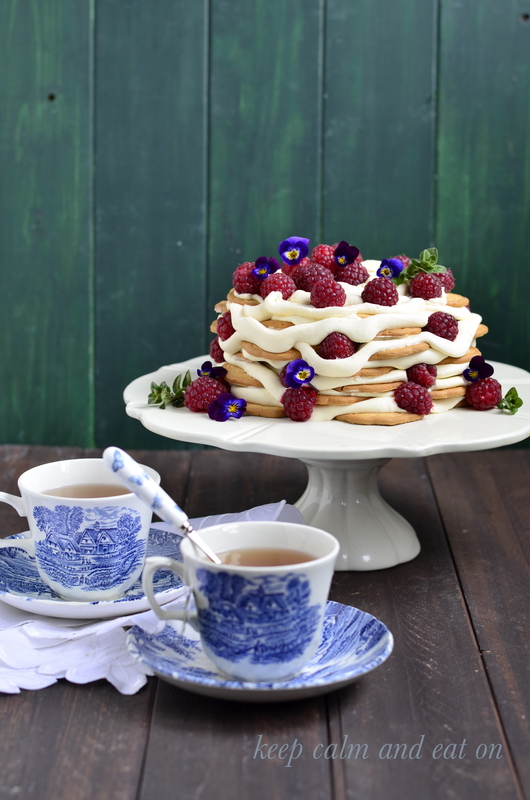 I experimented with the Lavender & Chai to make an easy ice box cake, just perfect to serve on a hot summer evening. 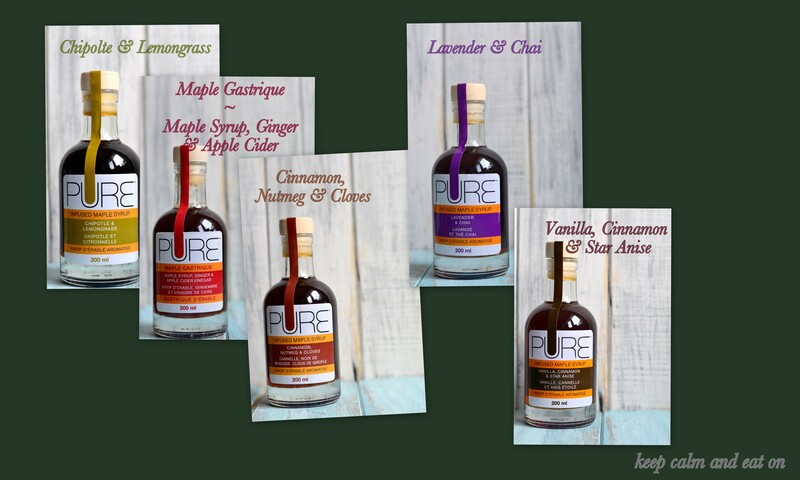 Disclaimer: I have received the products free from PURE Infused for review. Opinion posted on this blog post is my own. Product can be purchased online here. Product was also spotted for sale at Sobey’s, Elizabeth Avenue in St. John’s. Infused Maple and Rum Cocktail with Lime and Raspberries. 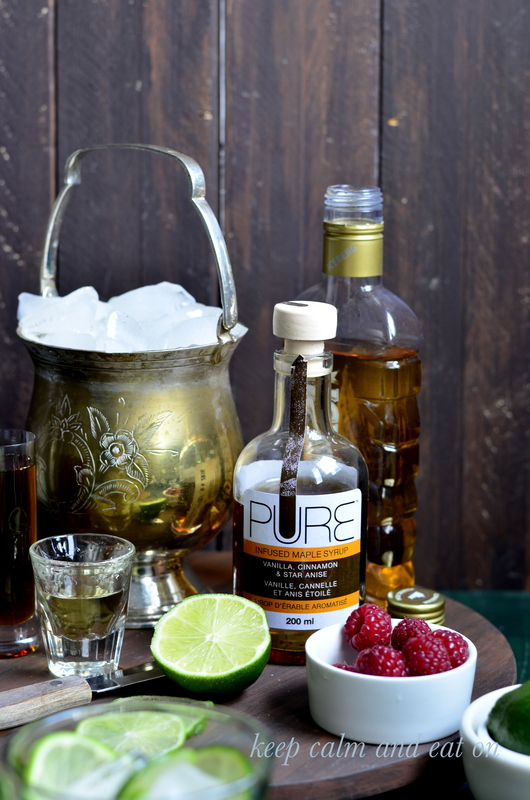 In a cocktail shaker, add maple syrup, rum, lime juice and 2 raspberries with 2-3 ice cubes and give it a good shake. 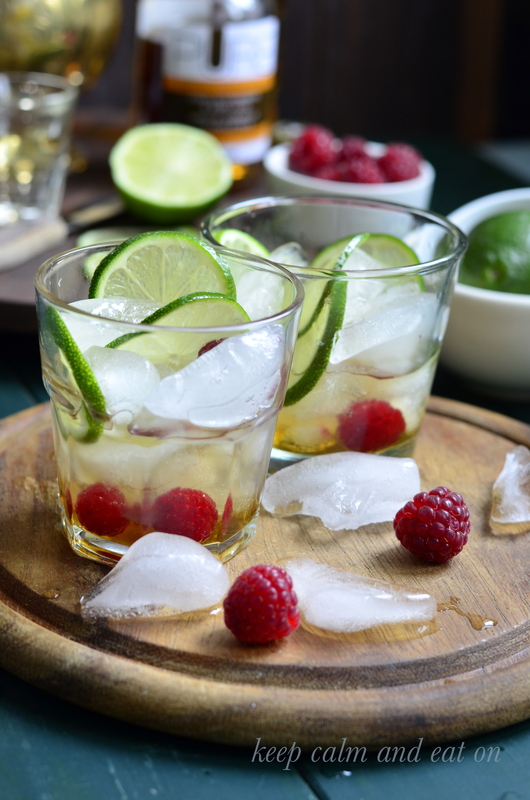 Add a few fresh raspberries at the bottom of your glass, fill half way with ice cubes. Pour cocktail mix over ice, and garnish with sliced lime before serving. 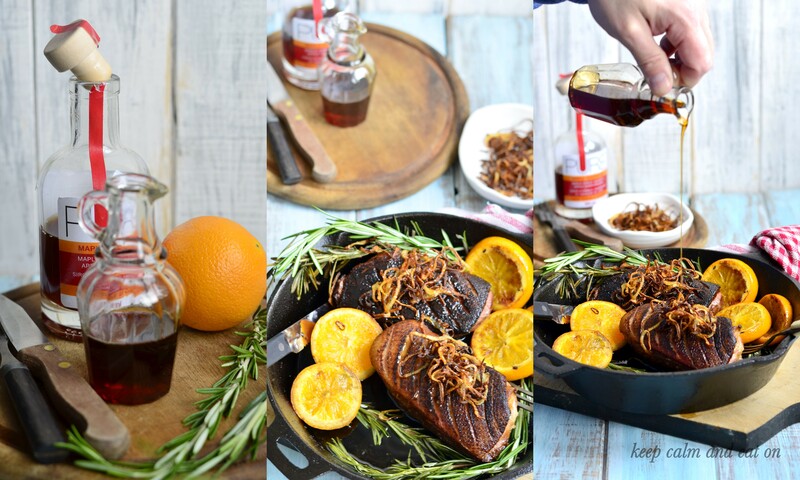 Pan Seared Duck with Orange and Rosemary, served with Crispy Shallots and Maple Gastrique. Pat dry duck breasts with paper towel to take extra moisture out of its surface. This allows the cooked meat to form a crispy surface. Run a sharp knife across the skin side in a crisscross manner or simply make diagonal strikes. Make sure not to cut through the meat, and only the skin. Heat your cast iron pan or a heavy bottomed searing pan on medium-high. When pan is hot, lay the meat with skin side down. Cook for 3-4 minutes, until the skin is golden and crispy. When ready to turn the meat, take pan out of stove and pour the excess duck fat into a bowl, leaving only very little for the rest of the meat to cook in. Add sliced orange and rosemary to the pan and sear the other side of the duck for another 3 minutes. The rosemary and orange slices will need to be moved around the pan a little and flipped. At this time take the rosemary out of the pan before it burns and orange slices can be reserved. Continue to sear the meat until it is done (another 2 mins). Fry the thinly sliced shallots in the reserved duck fat until it takes on a light golden colour. Take pan off stove and drain the shallots over a paper towel. Reduced the Maple Gastrique in a pan over high heat for 2 mins. Take off heat and let cool. 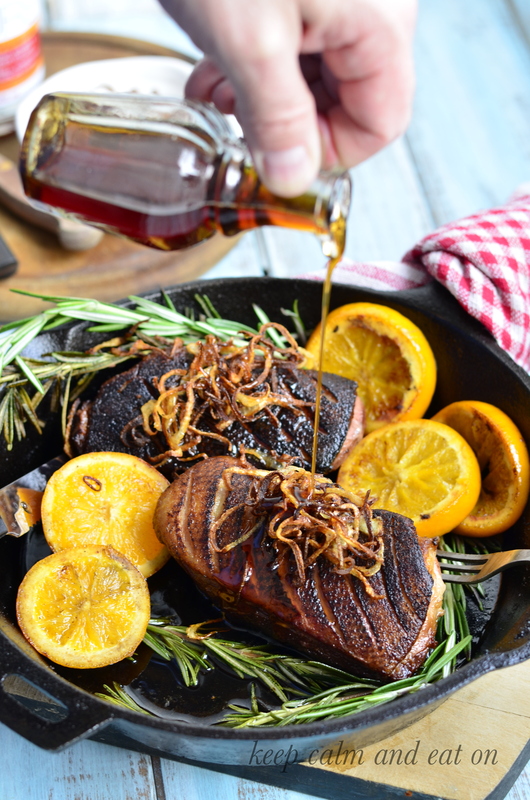 When ready to serve – place crispy fried shallots over the seared duck and drizzel the reduced gastrique, garnish with the fried oranges and fresh rosemary. Whip mascarpone with PURE Infused Maple syrup using an electric mixer. Add whipping cream to the mix and whip until nice and fluffy with very soft peaks but not too stiff. Fill the mixture into a piping bag. 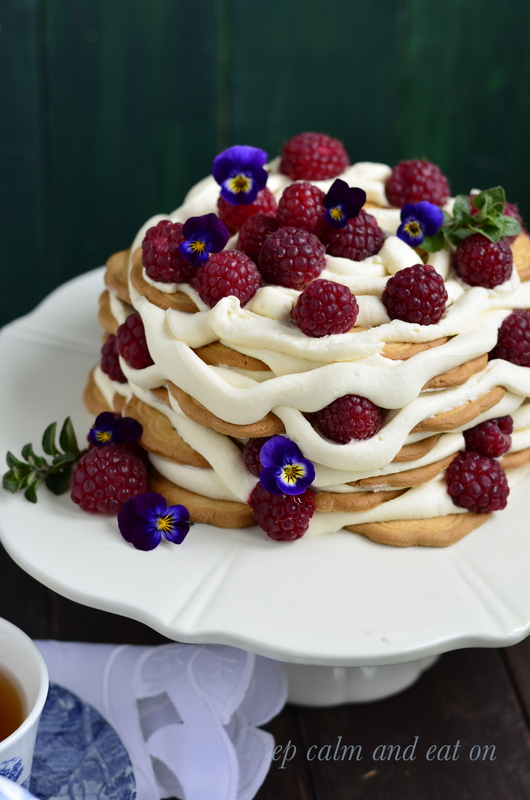 Arrange the biscuits in a circular pattern, pipe the filling over the biscuits covering the surface, scatter a few raspberries, continue with the leftover biscuits, filling and raspberries in alternate layers, finishing with filling and raspberries on top. Let sit for 4 hours or for best result over night in the fridge, well covered. Serve cold with a few sprinkles of fresh violas.